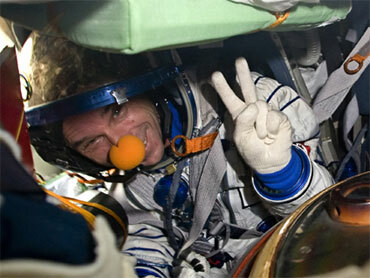 Sporting his trademark clown's nose, a grinning Guy Laliberte gave the thumbs-up after Canada's first space tourist returned to Earth early Sunday aboard a Russian Soyuz spacecraft. The founder of Cirque du soleil, along with American astronaut Michael Barratt and Russia cosmonaut Gennady Padalka, floated under a canopy of parachutes to a safe landing in Kazakhstan in central Asia. Russian space agency officials said re-entry into the atmosphere went smoothly and the landing was nearly dead on target. Strong winds caught the capsule's chutes, pulling it over onto its side after it touched down, but that is said to be typical of Soyuz landings on Kazakhstan's wind-blown steppe. Russian helicopter crews were on the scene immediately to help the three men exit the spacecraft. Russian television showed pictures of Padalka sitting outside the scorched capsule eating an apple and drinking tea. The 50-year-old Laliberte emerged later from the cramped confines, wearing his red clown's nose as he reclined in a chair. He appeared to be in good condition as he grinned into a TV camera. The space travellers were then taken to an inflatable medical tent for a quick examination and to rest up while reacclimating to the Earth's gravity. A Russian Orthodox priest was also present for the landing. Laliberte's mother and father, Gaston and Blondine, joined about 50 family members and friends who watched the landing at the Canadian Space Agency in Longueuil, just outside Montreal. "When we saw the red nose, we said 'He's OK,'" Gaston Laliberte told The Canadian Press in an exclusive interview. "For me, it was a good sign that he made the descent from space correctly." The aging Laliberte also admitted he was anxious when he arrived at the space agency to watch his son's return to Earth. "We are more happy than we were when we arrived - less nervous," he said. Laliberte's 80-year-old father says the next big event for him and his wife is the return of their son to Quebec on Oct. 24. He also joked that "maybe one day Guy will say he's going to the moon - we never know with him," he added. Before leaving orbit Laliberte hugged goodbye the six crewmembers who stayed behind on the International Space Station. Among them is Canadian astronaut Bob Thirsk who is on a six-month mission and is due to return to Earth on Dec. 1. Padalka and Barratt had both completed six month stints on the space station. The CSA's Benoit Marcotte says the Soyuz Laliberte travelled in is a reliable Russian vehicle that's been around for several decades and will be used more extensively in the coming years. The U.S. space shuttles are expected to be retired in late 2010 and Marcotte says until 2015, all astronauts will use the Soyuz to commute to the space station. But Canada will have to wait a few years before another of its astronauts visits the space station after Thirsk returns. "It will probably take three to four years before we have a chance for a Canadian astronaut to spend six months on the orbiting space lab," Marcotte said. Laliberte blasted into orbit with Russian Maxim Surayev and American Jeffrey Williams on Sept. 30 from the Baikonur Cosmodrome in Kazakhstan. The Quebec billionaire arrived at the space outpost on Oct. 2 for a nine-day stay. He spent US$35 million for his ticket to ride into space and an additional $6-10 million to produce his two-hour space extravaganza on Friday. Orchestrating the proceedings from his perch above the Earth, Laliberte hosted a global Web and TV broadcast to promote his crusade to preserve the world's water resources. Former U.S. vice president Al Gore, U2 and Shakira were among the entertainers and activists who participated back on Earth, performing in 14 cities on five continents.